Heartbreaking images are still emerging from the aftermath of Tropical Cyclone Idai in Mozambique and Zimbabwe, where devastating flooding has impacted 2.6 million people. Eighteen months ago, Category 5 Hurricane Maria wreaked havoc in Puerto Rico, leaving millions without power for months and causing many to relocate to the U.S. mainland. In November of 2018, 50,000 people were displaced by the massive Camp Fire which leveled the town of Paradise, California. Whether on the other side of the globe or right here in the western United States, the frequency and severity of climate-related disasters, from droughts to wildfires to hurricanes, are increasing as global temperatures rise. Climate change interacts with other social and environmental factors in often complex ways, so precisely tallying climate-related migration can be difficult. But by many estimates, the number of people who leave their homes each year due to climate change is in the millions, and growing. We don’t often think about displaced people when we think about climate impacts here in Missoula, but we are not immune to these issues. As we double down on efforts – locally and globally – to reduce carbon emissions, part of seeing the full picture of current and future climate impacts includes considerations around climate-related migration. Soft Landing Missoula is no stranger to the work of welcoming people who have been uprooted. Over the last three years, Soft Landing has helped smooth the transition of more than 250 new Missoulians who come from diverse lands like Eritrea, Congo, Iraq and Syria. Refugees who have made their way to Missoula have fled unspeakable horrors, forced to leave their homes due to conflicts – some with origins in climate issues including famine, drought and scarcity of resources. Climate Smart Missoula is working with local government and partners to ensure our community is planning for a range of climate scenarios. As Missoula grows, we will likely absorb some folks coming from places experiencing even more extreme climate impacts. 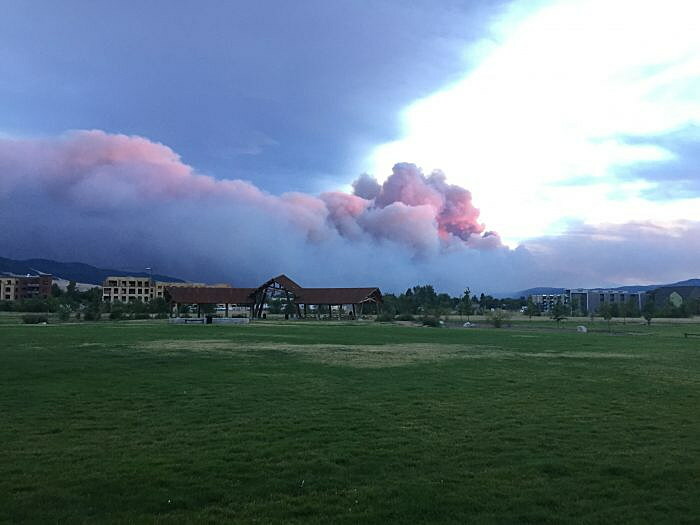 With increasing wildfire smoke and heat projected for our valley, it’s essential that we work to build a Missoula that is resilient and livable for all, especially the most vulnerable, and that we are equipped with the necessary tools and infrastructure to meet our community’s clean energy and climate goals. The Jeannette Rankin Peace Center works for a world where conflict and challenge is met with open minds and solutions that focus on cooperation instead of oppression and force. Nowhere is this more critical than when we are talking about the future of this planet we all call home. If we are to ensure our security for future generations, we must see the problem in its entirety with all its global implications and we must be responsible enough to engage with each other in ways that instill compassion, respect and accountability. Although the missions of these three organizations are diverse, we are united in the belief that there are better ways to deal with global climate migration than simply fortifying our borders, and that planning for climate change can prepare us to better deal with climate challenges as a community. Given the growing trend of climate migration, there is no better time to have a conversation about how we can step outside our boxes, and borders, to create solutions that bring opportunity and promise of a good life to all who call this valley home. What is our responsibility to those who are seeking shelter? Will we continue to place our faith in more secure borders, whether they be traced by walls or monitored by drones? Or will we recognize that boundaries between countries also carry the implicit promise of cooperation and mutual progress? Will we work for more equitable access to resources, or will we turn our backs on the most vulnerable? On Monday April 1, award-winning journalist Todd Miller will address these kinds of questions in a talk entitled “Refuge in a Changing World: Climate Change, Migration and Homeland Security.” Miller has researched and written about border issues for over 15 years. He resides in Tucson, Arizona, and has spent many years living and working in Oaxaca, Mexico. Miller’s talk begins at 6:30 p.m. in the UC Theater on the UM campus, followed by a brief panel discussion around the implications of climate migrants for Missoula and Montana. The latest in Soft Landing Missoula’s annual lecture series, this event is co-sponsored by Climate Smart Missoula and the Jeannette Rankin Peace Center, and is free and open to the public. We hope you will join us on April 1, and join this conversation. We don’t know exactly what the future holds, but this is a great opportunity to broaden our understanding of what it means to build a more resilient world and community that works for all of us. Abby Huseth is the Outreach Director at Climate Smart Missoula, Clem Work is a board member of Soft Landing Missoula, and Betsy Mulligan-Dague is the Executive Director of the Jeannette Rankin Peace Center. This Sustainable Missoula column is brought to you – via the Missoula Current – every Friday by Climate Smart Missoula and Home ReSource. April 1. Refuge in a Changing World: Climate Change, Migration and Homeland Security. Public talk by journalist Todd Miller. 6:30 pm, UC Theater at UM. Sponsored by Soft Landing Missoula, Climate Smart Missoula, JRPC and the University of Montana. April 5. Workshop on Living Zero Waste in Missoula. Email umflat@gmail.com to sign up. At the UM FLAT, 5pm. April 6. Permaculture Design Workshop. Using design principles from Nature (& systems thinking), learn how to create beautiful, diverse, sustainable gardens, homes and communities. At the MUD site, 1-4 pm. April 9. Climate Change & Extreme Events — how will cities respond? Free public lecture by Professor Nancy Grimm of Arizona State University. UM’s Todd building, room 204, 4 pm. April 11. Climate Smart Missoula’s Monthly Meetup: Local Food & Agriculture. Imagine Nation Brewing Co., 5 – 6:30 pm.